Front row- left to right: Connor Smith, Michaela Gronewold, Graci Bastert, Mackenzie Patrick. Back row- from left to right: Coach Patrick, Coach McKinney, Aubrie Carlisle, Sierra Hall, Shelby White, Jenna Bryan, Elude Trout, Coach Surprenant. 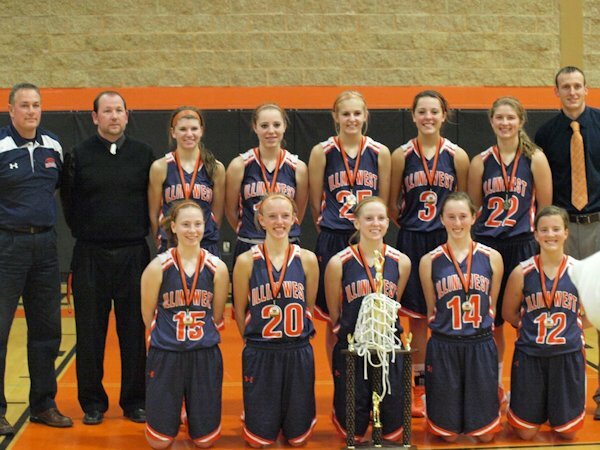 The Championship game score: 44-28 with Illini West over South Fulton. Illini West Graci Bastert was named MVP of the tourney and made the All Tournament Team. Michaela Gronewold was selected for the All Tournament Team as well. The record for the Illini West girls currently is 13-2 with play Tuesday night at Pittsfield.